The boot has been booted, the wheelbarrow has been wheeled out and the thimble got the thumbs down in the latest version of the board game Monopoly. In their place will be a Tyrannosaurus rex, a penguin and a rubber ducky. More than 4.3 million voters from 146 countries weighed in on which tokens they wanted to see in future versions of the property-acquisition game. It is based on the real-life streets of Atlantic City, New Jersey. Pawtucket, Rhode Island-based Hasbro announced the winners. Jonathan Berkowitz, Hasbro's senior vice president of marketing, grew up playing the game with his family. "While I'm sad to see the iconic thimble, boot and wheelbarrow tokens go, it will be fun to have some new, fan-sourced tokens in the mix," he said. "Personally, I've always especially liked the boot token. But I'm excited to move onto the T. rex." There were 64 contenders. They included a winking emoji, a hashtag, a clunky '80s-style cellphone and a pair of bunny slippers. The existing Scottish Terrier, battleship, racecar, top hat and cat tokens will carry on. The Scottie was top dog in the competition. It led all contenders with 212,476 votes. The T. rex was second with 207,954, and the hat was third with 167,582. The car was fourth with 165,083; the ducky was fifth with 160,485; the cat was sixth with 154,165; and the penguin waddled into seventh place with 146,661. The battleship made the final cut with 134,704 votes. The closest unsuccessful candidate was the tortoise, which fell nearly 5,700 votes short. A rain boot got the least support, with 7,239 votes. The next version of the game will go on sale with the new tokens in the fall. The board game was "born" on March 19, 1935, when Parker Brothers acquired the rights to it. In the decades since, an estimated 1 billion people have weighed the merits of buying up utilities and railroads or trying to hit it big with Boardwalk hotels. 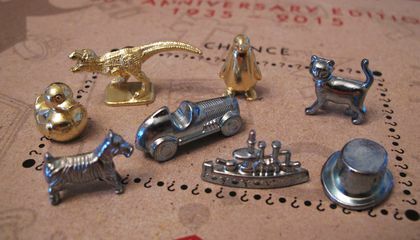 The original 10 tokens were an iron, purse, lantern, racecar, thimble, shoe, top hat, battleship, cannon and a rocking horse. Muppet with autism joining "Sesame Street"
Why has the thimble lost popularity? I think the thimble has lost popularity because it was to basic and not very creative. Also the new replacements are more appealing to children than a thimble. I believe the thimble has popularity because not nearly as many people are so sewing as they were when Monopoly first came out in the 30's. More and more clothing is being manufactured in factories, and many of the people who were taught to sew and stitch. Granted, some people, including some children, do enjoy sewing still. However most people prefer to have their clothes stitched up and made for them. I think the thimble is losing popularity because people want new and improved stuff rather than a thimble which in my opinion is that young kids probably won't even know what it is. I loved the thimble growing but now that it's going away is kinda sad and it was a classic so it is an original piece but we just got to go forward not backwards. The thimble might have lost popularity because people might not be aware of what it is, or do not think that such an old token should be worthy of staying in the game. Because it got less votes than any of the other tokens. Instead, it has been replaced by the penguin, the T-Rex, and the duckling. It probably lost popularity because people look at it go. " What is that?" Where has this generation goon to? In response to "Boot, wheelbarrow, thimble ousted from Monopoly board game," I strongly believe that this is a bad decision made by the makers of Monopoly. One reason I disagree with this decision is because this game has always been one of the most popular games of all time and the game pieces are a large part of this. Monopoly has entertained every generation since it was invented. Another reason I do not think the game pieces should be switched in Monopoly is because this game is one of the few games that has been enjoyed by thousands of families for so many years and is still so popular. Why change something that is still a big hit? 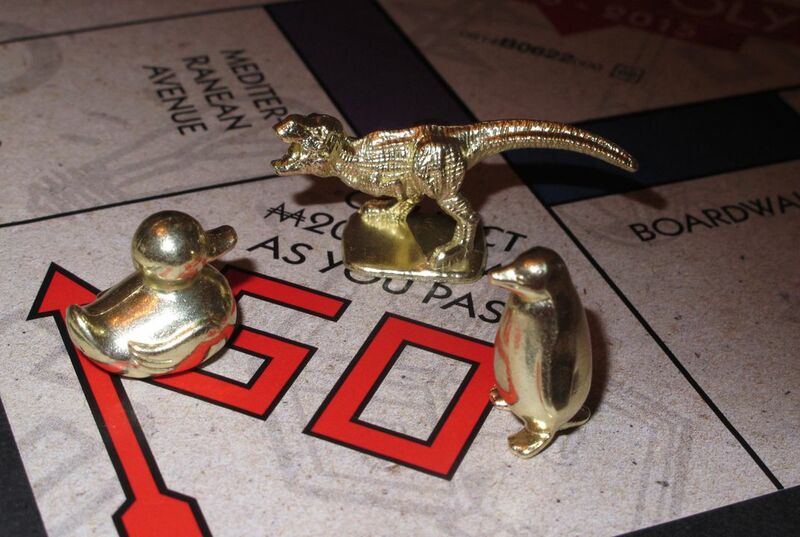 When deciding which pieces to add to Monopoly, the article states, "They included a winking emoji, a hashtag, a clunky '80s-style cellphone and a pair of bunny slippers". These were not around when the game was invented and I do not think they fit well with the other parts of the game. Although change is a good thing for most items, I do not feel this change is good at all. Changing something to improve the way it works is always a welcome change but this changes the classic style of Monopoly. There are so many versions of Monopoly that have been created such as Carolinaopoly, a Disney version and Christmas-opoly so why not create yet another one using those new game pieces? Even though many people voted and wanted this change, I think some things should stay the same and an amazing game such as Monopoly is one of those things that should keep the original game pieces the same as they were when the game was created. In response to “Boot, wheelbarrow, thimble ousted from Monopoly board game,” I found this article interesting for three reasons. First, I learned millions of people voted on the new game tokens. In the article, it states, “More than 4.3 million voters from 146 countries weighed in on which tokens they wanted to see in future versions of the property-acquisition game.” I am surprised that 4.3 million people across the globe actually took the time to vote on the game pieces. I knew Monopoly is a popular game, but I didn’t realize just how popular. Mostly, I didn’t realize that this game is so well know globally since the game is based on real-life streets in the U.S. I also thought this article was interesting because I learned what kind of objects people thought would make good game pieces. The article states, “The boot has been booted, the wheelbarrow has been wheeled out and the thimble got the thumbs down in the latest version of the board game Monopoly. In their place will be a Tyrannosaurus rex, a penguin and a rubber ducky.” I would have guessed that people would have voted for things like a Starbucks coffee drink or a cell phone. Those things seem more universal in my opinion. Lastly, I also learned some information about the board game. The article says, “The board game was "born" on March 19, 1935, when Parker Brothers acquired the rights to it. In the decades since, an estimated 1 billion people have weighed the merits of buying up utilities and railroads or trying to hit it big with Boardwalk hotels.” I was very surprised to learn that the game was introduced almost 85 years ago, yet still millions of people play and enjoy the game. It just goes to show that some things can be timeless. Even though some people may think that the game should just stick to the old tokens, I think that it is a good idea to switch it up and make it even more enjoyable for our generation.